The National Council Licensure Examination, NCLEX for short, enables men and women in the United States to become licensed nurses. The test is maintained and provided by the National Council of State Boards of Nursing (NCSBN), a nonprofit that represents the individual nursing boards in all 50 states, the District of Columbia, and the territories of American Samoa, Guam, Northern Mariana Islands, and the U.S. Virgin Islands. Prospective nurses must pass the NCLEX in the state or territory in which they wish to become licensed. Currently, two types of NCLEX tests are offered: NCLEX-RN and NCLEX-PN. The NCLEX-RN is required for licensure as a registered nurse, whose primary responsibilities include developing care plans for patients and monitoring their diagnostics. In 2014, the overall pass rate of this exam for all test takers was 73.16% out of 51,120 candidates. The NCLEX-PN is required for licensure as a licensed practical nurse, whose main duties include gathering data from patients and helping them follow their care plans. In 2014, the overall pass rate of this exam for all test takers was 73.08% out of 18,030 candidates. As demonstrated in the table below (see “What to Expect”), the NCLEX-RN and NCLEX-PN tests share notable similarities and differences. Eligibility for either the NCLEX-RN or NCLEX-PN is determined by state boards of nursing, not the NCSBN. Candidates are encouraged to contact the board of nursing in their prospective state or territory of employment with specific questions regarding eligibility. Find more information about nursing in your state here. Candidates must submit an application of licensure in the state or territory where they wish to practice; the annual deadline for these applications is decided by each individual board, and may vary state-to-state. Once their application has been received and approved, candidates must register with Pearson VUE, the nationwide testing center where NCLEX is offered. At this time, U.S. residents are required to pay the $200 examination fee; international exam-takers pay an additional $150 surcharge. Online: Candidates may pay with a credit/debit card (VISA, MasterCard, or American Express), or a third-party payer, such as a nursing school or employer, may cover the expenses if such an arrangement has already been made. Money orders, certified checks, or cashier’s checks are not accepted. Via Telephone: Candidates in the U.S. may register with any of the aforementioned credit cards by calling this toll-free number: (866) 49N-CLEX (1-866-496-2539). Hearing-impaired candidates can call the following toll-free TDD number: (800) 627-3529. The numbers for non-U.S. residents (not toll-free) are listed in the “International Nurses” section below. Once an NCLEX candidate has registered and received an eligibility letter from the state board of nursing, the exam can be taken any time over the next 365 days, provided the candidate meets all state board of nursing requirements. Those approved to take the exam receive an Authorization to Test (ATT) email containing “validity dates” that state when they are able to take the exam. First-time candidates are given a 30-day window period to schedule their test, while candidates retaking the exam receive 45 days. While test takers can choose dates within a 365-day window, the scheduling must be done in either the corresponding 30 or 45 day window. Once the exam-taker schedules an appointment, Pearson VUE sends a confirmation email. At this time, the individual should review all information to ensure it is accurate; those who do not receive a confirmation date should contact Pearson VUE as soon as possible. Candidates should note their registration fee is non-refundable and forfeit if the state board of nursing denies or revokes their eligibility to sit for the exam. Additionally, candidates are not allowed to have more than one active registration. In the event that two or more exist for the same person, the most recent registration will be denied, and the candidate forfeits the registration fee. Registered individuals may change the state board of nursing listed on their account for an additional $50 fee if their prospective place of employment changes between the time they open their account and their exam date; candidates must pay the $150 international surcharge if they transfer their testing location to a center outside the U.S. Switching the exam type from NCLEX-RN to NCLEX-PN, or vice versa, also results in a $50 surcharge. Candidates should locate their nearest testing center online. The NCSBN urges candidates to arrive at least 30 minutes prior to exam time. Candidates should also dress comfortably; hats, scarves, gloves and coats must be taken off and left outside the testing room, although provisions are made for men and women dressed in religious apparel. *At this time, individuals with Cuban passports are unable to sit for the NCLEX because of current U.S. sanctions against the country. If the candidate has undergone a name-change, and the name on the NCLEX registration does not match the name on their identification, then they must provide a marriage certificate, divorce decree, or court documentation of a legal name change. Those who arrive without valid identification will not be allowed to sit for the exam, and will forfeit the $200 registration fee and all other charges paid up to that point. There is no predetermined order in terms of content, and questions from the different categories listed above will appear at random. The NCLEX-RN and NCLEX-PN are considered ‘computer-adaptive,’ meaning the sequence of questions a test-taker receives is determined by his or her responses to earlier questions. The exam becomes progressively more difficult until the computer can determine “ with 95% certainty” that the candidate has either passed or failed; as a result, each exam-taker could potentially receive a different number of questions (but no one will receive fewer than 60). When 95% pass/fail certainty has been attained, the exam automatically end. Due to this design scheme, it is crucial for all candidates to thoroughly study all of the different categories prior to taking the exam. Candidates testing for a board of nursing that participates in the Quick Results Service may receive their exam score 48 hours after completion; this option is available with a $7.95 fee. 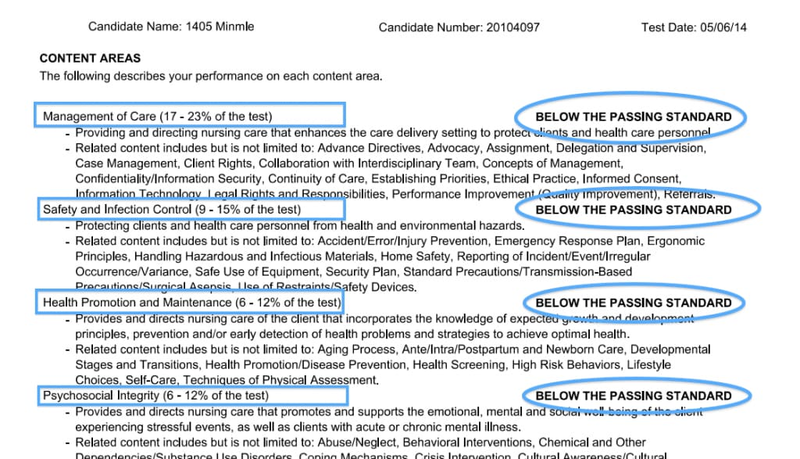 Otherwise, the state board of nursing mails candidates their official scores approximately six weeks after they sit for the exam. If results have not been received within that timeframe, candidates should contact their board. If the candidate receives a passing score, then they should receive a separate item in the mail containing their official RN or LPN license. Candidates who have successfully passed the NCLEX-RN or NCLEX-PN are encouraged to volunteer with the NCSBN to create questions, review exam content, and serve on a judging panel that determines passing standards from year-to-year. They may also choose to join the NCLEX Joint Research Committee, an organization that develops and evaluates research projects performed in conjunction with the NCLEX. *Illinois, Massachusetts, Minnesota, and New York are currently in the process of joining the NLC. All other states require RN or LPN licensure specific to that state alone in order to practice. Multistate license-holders who move to a non-NLC state must apply for a new credential from that state’s board of nursing and (pending approval) will be given an individual state license, at which point their multistate license will become invalid. This video from the NCSBN does an excellent job demonstrating this process. Renewal of one’s nursing license and re-certification of skills, typically earned through continuing education courses, are required in all U.S. states and territories. Although deadlines vary by board of nursing, most boards require recertification every five to 10 years. Although the majority of first-time NCLEX-RN and NCLEX-PN candidates earn a passing score on their exam during the first attempt, many others will fail and be forced to retake the test. If you do not succeed on the first try, it’s important to remain hopeful ― and realize that you will be given at least three more chances to pass the exam. Those who do not earn a passing score are able to retake the exam, although they must wait 45 to 90 days after the first exam to make their next attempt, depending on the requirements of their state board of nursing. Candidates may make as many attempts during their 365-day eligibility period as allowed by their board, but they must register with Pearson VUE and pay the $200 exam fee for each additional attempt. Contact their state board of nursing and notify the organization of their plans. Once they have been approved to retake the test, they should register with Pearson VUE and pay the $200 exam fee. When a new ATT (Authorization to Test ) has been received, the candidate is able to schedule a new appointment date. The candidate should study, study, study! Those who do not pass the exam the first time should concentrate their studies on the areas listed under the ‘Below the Passing Standard’ section of the CPR, then work up to the sections listed under the ‘Near the Passing Standard’ section, and finally review the content they passed during the initial exam. During this time, candidates are encouraged to consult online study guides, forums, chat rooms, and other resources in addition to the CPR in order to increase their chances of passing the second time. The exam content, as well as the registration requirements, is identical for international nurses and U.S. candidates. However, sitting for the exam in any of the aforementioned locations costs $350 per attempt: the standard $200 fee, plus a $150 international surcharge. Like fees for taking the exams in the U.S., these international fees are non-refundable if candidates decide to cancel once the payments are processed. The only valid form of identification at an international testing center is a passport signed in English. If an international candidate receives a passing exam score, then he or she will be qualified to practice nursing and will receive a license from the state board of nursing to which he/she has applied. If you have additional questions about either the NCLEX-RN or NCLEX-PN, please visit the NCSBN’s official website.